GREENGUARD® Gold certified. 15" deep offset locker gives children room to sit down and take off their shoes. 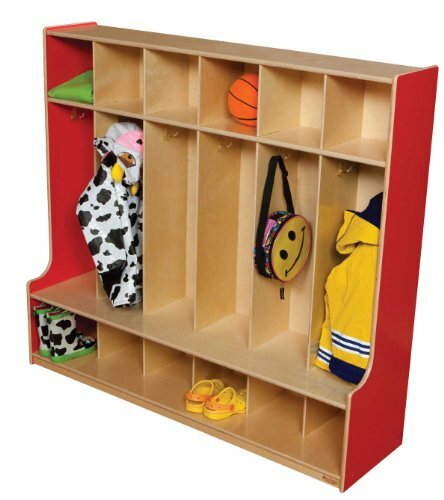 (6) double hook sections with storage above & below make this our most popular locker unit. All surfaces and back are 100% Healthy Kids™ Plywood with our exclusive Tuff-Gloss™ UV finish. Fully assembled. 49"H x 54"W x 15"D.
15" deep offset locker gives children room to sit down and take off their shoes. All surfaces are 100 Percentage Healthy Kids plywood, color Strawberry Red, with Tuff-Gloss UV finish Back is 100 Percentage Healthy Kids plywood. with Tuff-Gloss UV finish. (6) double hook sections with storage above and below. Promotes a healthier early learning environment. Does not emit any harmful contaminants (VOCs) into atmosphere. Product Dimensions: 49"Hx54"Wx15"D. Product Weight: 105 lbs.